I was only twelve when I moved, and at that age, the only gardening I enjoyed was digging up worms to scare my sister (if you even call that gardening!). Years later I’m now a keen gardener, I’m no Monty Donn, but I love planting things and watching them grow, raising seeds into adulthood, growing food for the table as well as digging up worms to scare my sister. Now I’m (cough) 35 and rather than looking at the end of the garden thinking “that grass needs cutting” or “I’d better rake those fallen apples” or “I’d better trim the Leylandii as the International Space Station will be getting snagged in it soon”, I thought I’d redesign the whole lot! I decided I wanted a lushious, lusious, erm, leafy, verdant area full of tropical plants. Something out of Tarzan or The Jungle Book – a jungle! However, before I created my Christchurch Rain forest, I needed to remove everything that was there. A mammoth task was to unfold, alas no mammoths were available at the DIY store, so I had to do it. First the Leylandii went (woohoo!! 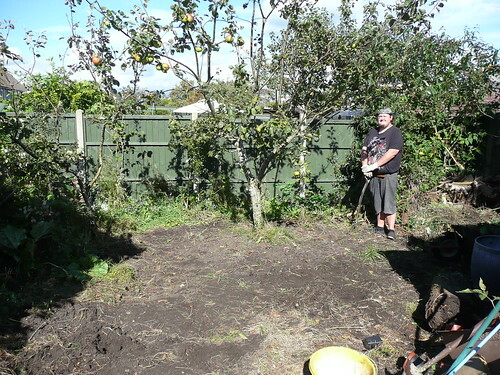 ), then the sky high grass was dug up. It was only then I found a small tribe of semi-nomadic people who’d been living in the grass for the past twelve years, they’d been living off fallen apples and feared the wrathful god they called ‘the giant raking man’. I digress.